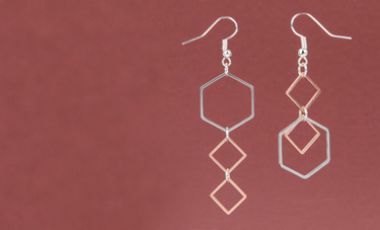 This week’s Mini-Make tutorial combines two trends in one, geometric shapes and mixed metals! These two trends were so big in 2016 that geometric patterns and metallic finishes continue to lead fashion industries and home decor designs. I’ve made two styles of earrings using the geometric soldered ring shapes that can be worn as a matching pair, or asymmetrically for an edgy look! For this project I used a silver plated findings kit however, you can also purchase the following findings individually.